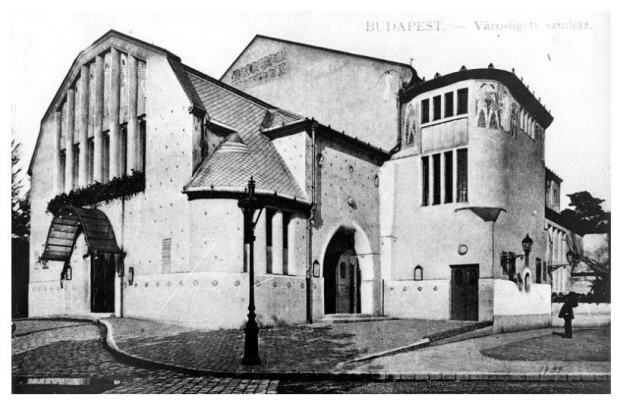 Viktor Orbán, most likely at the suggestion of the director of the Museum of Fine Arts, László Baán, decided on the creation of a museum quarters. But the idea of clustering museums was in reality just attractive packaging of what amounted to an eviction notice. Several galleries currently housed in the former royal palace must move because Viktor Orbán wants to put the core of his government where in his opinion it belongs, the ancient seat of the Kingdom of Hungary. Indeed, billions of forints will be spent and thousands of trees will have to be cut down to create this absolutely unnecessary project to which, on top of everything else, the people of Budapest strongly object. In February Ipsos, a Hungarian polling company, posed several questions, all concerning the future of the Castle District and the fate of Városliget. 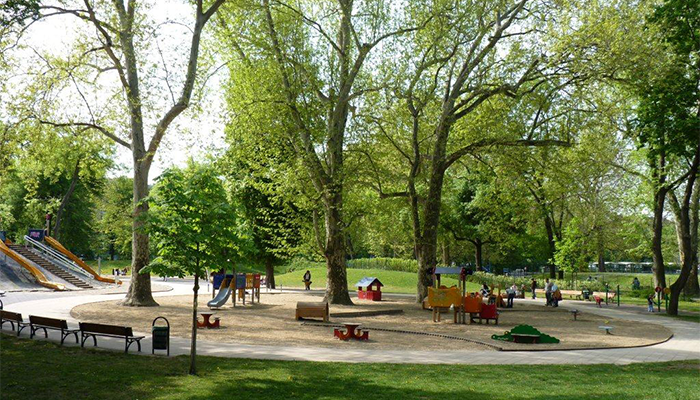 The overwhelming majority opted for the renovation of the park and against erecting new buildings within the park. In fact, 85% of those surveyed wanted to have more parks in Pest and thought that another park could be fashioned out of the region lying behind the Western Station. A proposal to hold a referendum on the question was turned down by the Kúria, Hungary’s highest court. By now it should be clear to everyone that a referendum can be held in Hungary only if it is in the interest of the government. And surely, given public sentiment in Budapest, the results would have put an end to Viktor Orbán’s dreams. Who are the “grove defenders”? As far as I can ascertain, we are talking about a group of 40 or 50 people who decided on March 17 to occupy a part of the park where one of the existing buildings is to be razed and a modern building, House of Hungarian Music, designed by the Japanese architect Suo Fujimoto, is to be erected. Ever since mid-March there has always been a small group of people on site to make sure that no demolition work can begin. They are a varied lot. There are environmentalists who chain themselves to trees. 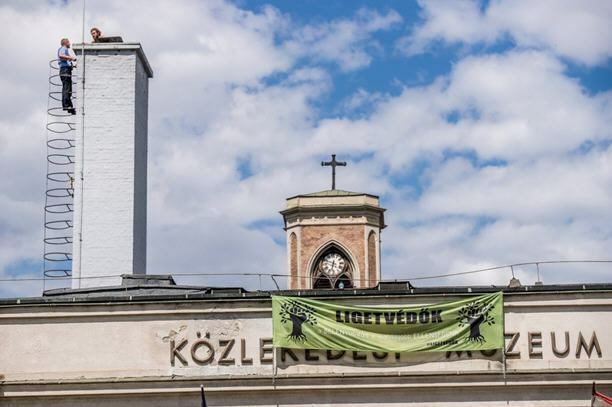 There are urban planners and architects who have grave reservations about the kind of “restoration” the Orbán government has in mind, at least in the case of two of the buildings: the Hungarian Museum of Engineering and Transportation and the Városliget Színház. 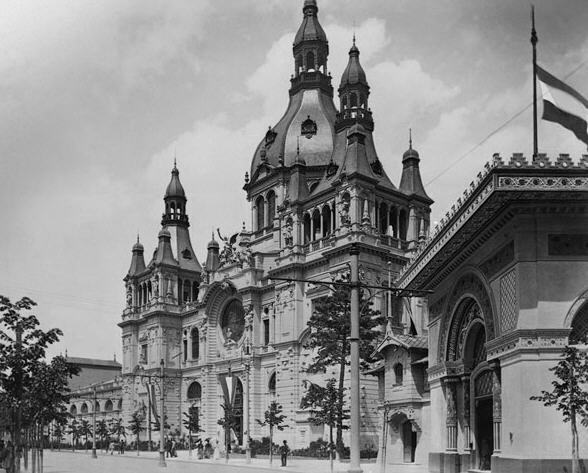 The Városliget Színház, built in 1874, was razed in 1952. Looking at an old photo of it, I see no particular reason to rebuild it, which is not in accordance with acceptable restoration practices in the first place. The Museum of Transportation, which was heavily damaged during World War II, was restored in a truncated form sometime in the 1950s. The government plans to raze the building and rebuild the horrendous original. 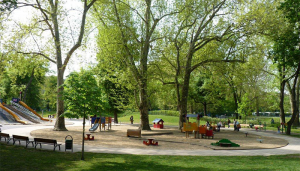 Although the majority of Budapesters object to the whole project, very few have been ready to keep vigil at the park to keep the demolishing crew of Bont-Tör Zrt. (Wrecking and Breaking Co.) away from the old museum building. But those who did were not ready to move, and it was almost inevitable that sooner or later there would be a showdown with the company’s private security contingent. In the end even the police decided to enter the fray. The grove defenders maintain that the private security forces and the police work together. Eventually some of the demonstrators managed to get to the building and chained themselves to the iron bars on the windows, from where the police eventually moved them one by one. About thirty people were removed in this fashion. In the scuffle some of the demonstrators were injured. For example, Imre Mécs (82), a hero of the 1956 Revolution, was knocked over. The most spectacular event of Wednesday was the ascent of Gergely Komáromy, the leader of a reggae band and one of the grove defenders, to the very top of the chimney of the building. After spending a few hours there, he eventually came down on his own. The police immediately handcuffed him, forced him into a car, and took him to a rehab center. The story from here on is murky. The police’s story doesn’t jibe with his own. Meanwhile, the skinhead security guards had lost patience with the demonstration. When Komáromy again climbed to the top of the roof yesterday, he was followed by three or four guards, one of whom hit him in the pit of his stomach. He collapsed. This time he was taken to the hospital by ambulance. The security guards denied any wrongdoing, but since then a video taken by a smartphone emerged on which one can clearly see the blow. Judging from the short video, I’m not surprised that, as Komáromy told reporters after his release from the hospital, he felt in mortal danger atop that building surrounded by muscle-bound skinheads. As one of the reporters of Index wrote tonight, just watching the video is a harrowing experience, and what is especially upsetting is that the police officers who were present didn’t move a finger. The work must go on because Viktor Orbán is intent on moving to the Castle.